Taken post-race in the warmth of my living room. 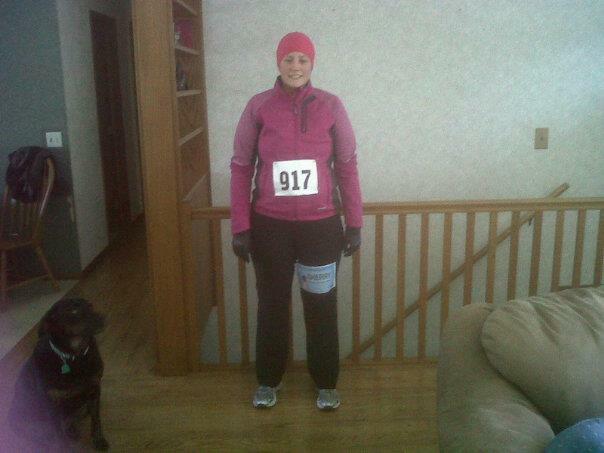 On Saturday, February 11th, I ran the Freeze Your Bunz 5k in North Branch. The morning was a cold one with a temperature of 8 degrees and 12 mph cold winds at race time. Brrr! I dressed as I have all winter, wearing long underwear bottoms, my running pants, long sleeve wicking shirt, thin running jacket, running hat and gloves. In retrospect, I should have had heartier layers on my bottom half. Since this race is within walking distance of my house, I typically walk to the race and walk home. However, with the cold, I didn’t want to spend any extra time outside; particularly after I’d worked up a sweat. I chose the lazy way of driving over and was glad I did because I had a little mix up on the race time and thought it started a half hour earlier than it did. Because I drove, I was able to go home and visit with my mom in my warm house before the race. There are usually around 100 participants for this race, but the weather must have kept a lot of people at home. Well, that and the fact that the race information was only available about 2-3 weeks prior to the race; I think this was probably due to the race having a new organizer/sponsor this year. The total number of participants was probably closer to 50, though I haven’t seen any official race results yet. I’m sure it’s clear by now that this was a bare bones race. There was a single table for race registration and snacks, a time clock and a Suburban with speakers set up for the festivities. No porta-potties, though there are public trail restrooms a block away that I believe are open all year. With the registration cost ($20 or $25), pre-registered participants received a shirt. Those who were not pre-registered did not a get a shirt. No other items were given out in the race bag/packet and this was not chip timed event. Post race fuel consisted of coffee, water, oranges (not peeled or sliced), bananas and protein bars. Previous years featured bakery cookies, hot cocoa, and Pizza Hut bread sticks so this year was a little disappointing. The course is a flat out-and-back on the Sunrise Trail. I planned on running faster/harder than usual because of the easy course, but the weather and my legs did not work together. Thankfully the course was dry because of the mild winter we’ve had; last year, the path was a sheet of ice. Last year’s recap can be found here. One thing that surprised me was how nice everyone was. All of the participants were smiling and everyone was giving high fives, thumbs up and encouragement. The runners leading the pack were saying “good job” to all of those they were passing. The camaraderie was impressive and made the cold seem just a little more tolerable. My finishing time was 33:43, which was a little disappointing, but my February race for 2012 is now done. I’m thinking I may not do another race this month and instead wait until my race on March 17th, when it should be a bit warmer out. Bib for the Sherry Arnold virtual race. What was most different about this race was that this was the first time I had run for someone else. 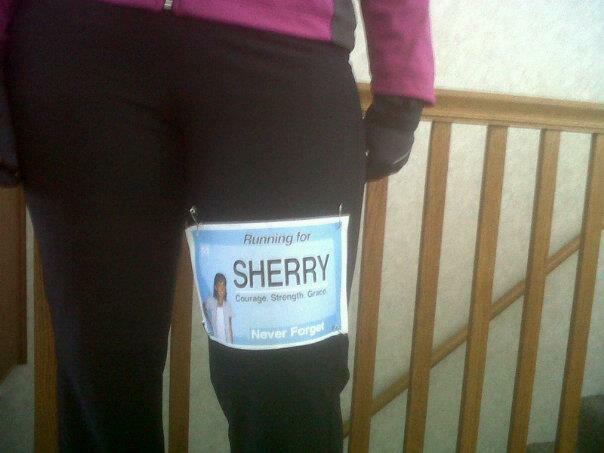 Saturday was the day of the Sherry Arnold virtual race and in honor of Sherry, I donned the official race bib on my leg during the race. Whenever I thought I needed to walk to catch my breath or that my legs were too cold to keep running, I reminded myself that Sherry would love to be running on a cold Minnesota (or Montana) morning. Instead, her life was taken too soon. I spent most of my run thinking about and praying for those who now have to live without her. It doesn’t matter than I didn’t know her. What matters is that her friends, family and students are hurting because of a senseless crime. Runners from literally around the world came together on Saturday to run in Sherry’s honor. It brings me to tears just thinking about it. 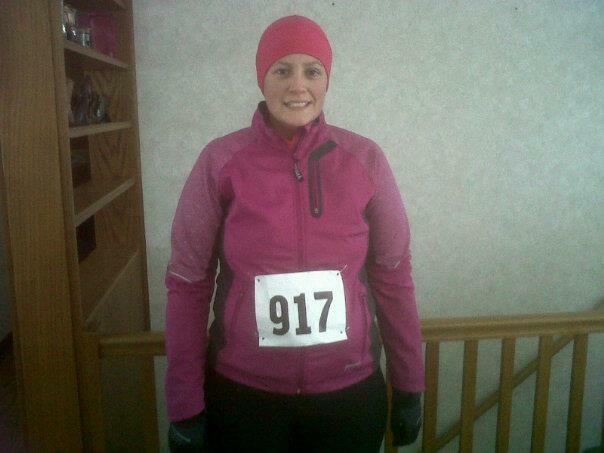 More about Sherry and the virtual race that was held in her honor can be found here. The dog (Tyson) really wanted to be in the picture, too! Woohoo, congrats on your Feb race. I’m still jealous of your ability to sign up for and do so many races in a row!